This week was an amazing week for the game, it scored positive press on both Kotaku and Eurogamer. This really is amazing, I honestly couldn’t have hoped for more! These are the two most frequented websites by my browser after Gmail, so getting featured lets me feel like I just played a show at Reading festival in the tent at 9 am (it’s a big music festival in the UK). You know, no one really cares who I am, and I won’t make any money out of it, but at least I am on the same billing as Black Sabbath (with Bill Ward). That was a bit of an abstract introduction. Anyway I wrote most of this post yesterday, but now have to edit it a bit…primarily because now it’s today and another 24 hours sales have rolled in, and thanks to the Kotaku article, I had an exciting trip into my iTunes connect account. So yes, all those bars that don’t look like bars are the sales / downloads to date, and that bar that looks like the only bar is just huge and dwarfing the others. It represents the last 24 hours. Kotaku is a not just a videogame site it also covers Japanese culture, so it feels like the perfect pairing for my app. 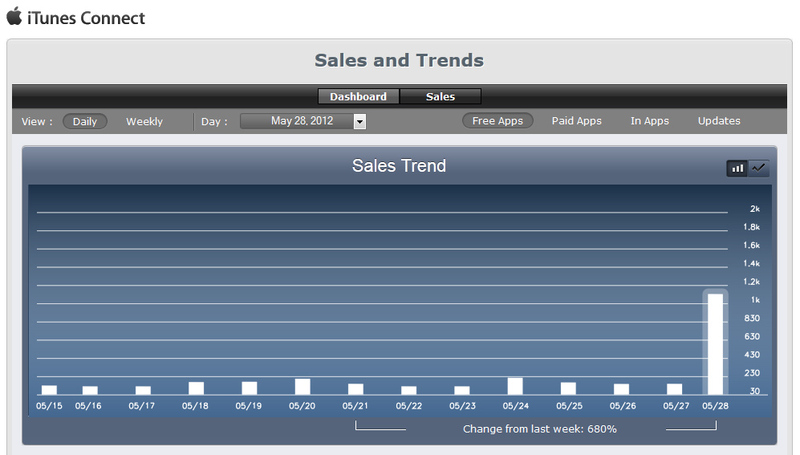 Anyway, this may well be the final spike in sales before death creeps in (although clearly I hope that it isnt! ), not that I will stop supporting the product. Anyway, maybe that doesn’t matter too much, I feel like the game has been successful even if it hasn’t been you know “successful”. The press has been amazing, as has the response from people actually playing the game. It’s great when people send an email and talk about their experiences with the app, it makes me remember that I am not just doing this in a vacuum, and most of all that people are actually playing and enjoying it! Just having a few people like the game is a big enough emotional reward for me to think it was all worthwhile. iOS 4.2 and beyond…This was the main reason I wanted to do the update (and I am a little worried that it may have made some bugs). Anyway, some people have tried to download the game and been faced with the message “iOS 5.1 required” if your phone/iPad doesn’t have iOS 5 or above you have to connect it to a PC, and then mess around for about two hours before you get it. From my experience, some people have never connected their phone to a PC, because it’s a phone, and made for phoning people, anything else is just a bonus. The point is I am not sure that anyone would actually update their device to get the game, which means we have been missing out on quite a few downloads. I found some data which puts people below 5.1 at around 40% of users. This was related to games, so I imagine for people interested in education apps this figure might be somewhat higher. While another 40% boost on the downloads would still not pay my rent for the month, just having more units out there allows for more word of mouth which might convert into more sales. But I saved the biggest most important fix in this list until last: in the pause menu the text “GamePaused” has been replaced with “Game Paused”. So I finally uploaded v1.1 last night…I really hope I didn’t break anything! This week marks the 9th week of me doing this, and while I am not heading for the app every 4 weeks goal, it isn’t looking too bad, game number 2 has a lot of testing and music writing to do, but for the most part it is starting to feel like an actual game. It also has a name: “Nuclien”. Next week I can tell you about Bandcamp and game soundtracks, and chicken heads! People do enjoy your game! So please continue producing amazing games~! Looking forward to Nuclien.. The game is really, really cool, congratulations on an amazing achievement. But how did you decide on $2 as the price for all the missions? I think that’s TOO LITTLE. Maybe this is just your launch pricing to try to build momentum and you’re planning on raising it later. If I were you I would give away more missions for free, maybe 24 instead of 12, as the game starts getting more fun when you have more characters to work with, and charge substantially more for all the missions (at least $5, maybe $10). IMO your game is priced like a simple action game with extremely broad appeal — pocket change, $2 doesn’t even feel like you’re spending money. But your game’s market is not as broad as that, so you can’t count on getting as many sales as that, plus it is educational, and people are willing to actually feel like they’re spending money for educational things. 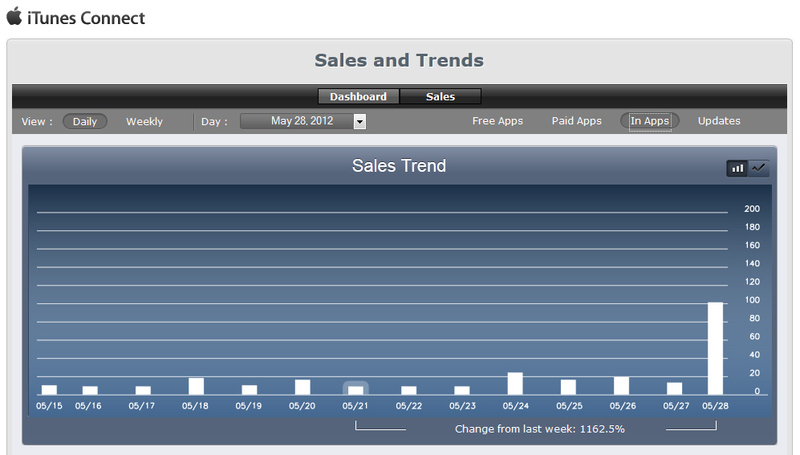 If you charge $10 you can make fewer than 1/4 of the sales you would have made at $2 and come out ahead. Thanks for the feedback! it’s funny about 2 daYS before the game came out I cut all the prices in half. Because of the IGN thing, I was hoping the game would cross over in to the gamers market, and actually get me a few extra bucks. It’s a weird place for the game to sit, it’s kind of almost gamey enough for gamers, but the fact that it is still educational probably puts people off. I wanted to try an ad supported version on WIndows phone, but their registration system is a horror (I can’t use advertising if my account is registered in Singapore, so I tried to change it, but I cant…even though the credit card I pay my developer license with is English!). If I do the reading/spelling update then perhaps I will up the cost of the DLC, but leave it free to those that have already purchased it (I suspect they will have learnt their syllabries by then anyway!). Thanks again for the feedback! « Is this the droid you are looking for?